First of all, depending on when you go to pick, you can also pick raspberries, blackberries and/or pumpkins. When we visited last year, we could pick raspberries along with the apples. Nice surprise! We took a pleasant ride into the orchards. The driver explained all of the apples to us, so it was easy to choose the ones best for us. Picking was fun and, while we could have had a ride back to the main area, we chose to walk to further enjoy the day. Royal Oak Farm also has a large and inviting children's play area. They have a children's train and carousel that kids can ride. You do need to purchase tickets for these rides. Additionally, there is a petting zoo. The petting zoo and play area are free. When we visited, the farm was definitely full of happy kids enjoying the play area. Our daughter could have spent the whole day right there! For those looking for produce or baked goods, the orchard does have a farm stand and bakery. There is also a country restaurant. I was definitely tempted by the baked goods but resisted the temptation because we had just returned from spending the weekend at my grandmother's--which means I had already consumed enough baked goods for a couple of weeks! Royal Oak is a festive place and has many events throughout the season. The U-Pick hours are 9:30AM-5:00PM, Monday-Saturday through October 31. The Farm is closed Sundays. The dates and times are subject to change depending on weather and crop yield. On Saturdays and holidays, Labor Day - Oct. 31, there is an admission fee of $3/car, $1/motorcycle. If the festivities extend into November, there is no admission fee in November. Please check website for costs of U-Pick. When we returned home, we put our apples into some Forever Bags and put them in the fridge. They lasted a long time! We had a fun time and would go back. 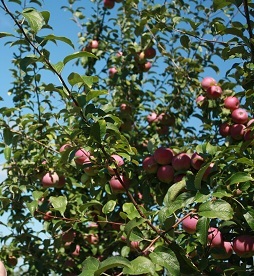 While orchards were hit hard by this year's wacky weather, Royal Oak does have apple picking. However, there will be a limit on the amount picked.